What’s more fun than steaming and scraping wallpaper off the walls of a 24′ by 13′ room? Well, nearly everything is more fun than that. I’d rather take a grad school statistics class again. I’d even go to the dentist. I survived wallpaper removal by dreaming about DIY coffee table ideas while steaming and scraping. Dreaming up ideas is part of the fun of the One Room Challenge. And right now, 20 featured designers and about 200 guest participants (folks like me!) are making their design-dreamy ideas come true during this six-week challenge to makeover a room. I am doing “Operation Lighten & Brighten” on our family room, to take this space from dark and dreary, to hopeful and happy. See lists at the bottom of this post to see what we’re doing. Visit the Week 1 post to see the overall vision and moodboard. Bwa ha ha. See what I did there. That needs to be a poster, for those of us who love to decorate. I pinned an obscene number of coffee tables on the Pinterest board where I collect ideas for this makeover. The Pinterest board helped me easily see the elements of coffee tables that I liked. After a late-night pinning spree, some clear groups popped up on the board. If you use Pinterest, I’d suggest that looking for the patterns and themes in the things you pin is a great way to discover your style. Links below include affiliate links. Sooooooo … one of the tables shown above is almost $19,000! Another is almost $38,000! So I’ve been on Craigslist and Facebook Marketplace looking for affordable tables, preferably older tables that are good quality, low price. I found this one on FB Marketplace, only $50. Wouldn’t it be perfect if I painted it with a metallic texture and patina (more on that below). So the lesson here: Look at the expensive things to learn from them and discover what you like. When you see something you like and it’s beyond your budget, watch online secondhand markets. You might find the perfect piece at the perfect price. Looking at a $38,000 table opened my eyes to seeing this $50 table. I am loving coffee tables in bronze and dark antique brass, but also tarnished silver and burnished gold, with textures and mottled patina. Oxidation. Etching. You’ll see metallic texture + organic shapes here! Two loves in one! I love to DIY and I’m seeking something that I can paint and/or build, a surface I can change. 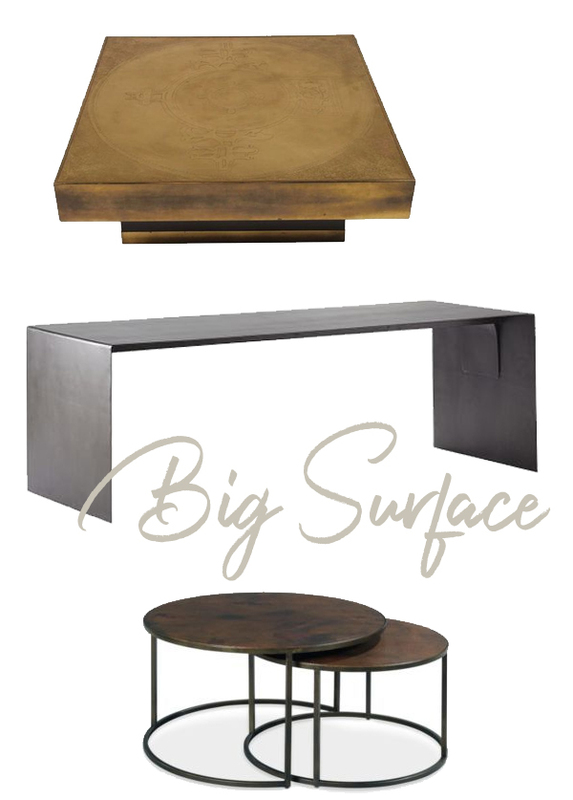 The broad surfaces on these tables make me salivate, thinking of how you could add metallic texture and patina! I wouldn’t DARE do that on the first one though — it is collectible and pricey. But it gets the ideas going. A coffee table is the only new piece of furniture I’ll get for this room. This makeover will lighten up the walls, oak shelves, floor, ceiling, and fireplace. I’m changing the surfaces of the room instead of the stuff in the room. For many years, an old Chinese chest has been in the “coffee table spot” in this room. But it’s more like a display. The top of it is covered with decorative things. I don’t want to set glasses of liquid on it and things that could damage it! So we have nowhere to set mugs, wine glasses, small plates of food, laptops, books, etc. We wind up scooting things over on the bookshelves and setting mugs there. I set mugs on the floor and sometimes I kick them over. I set a plate of food on the floor and hope I don’t step on the food! We need a FUNCTIONAL horizontal surface. It’s not a want — it’s a true need here. Thus, all the coffee table inspiration. You can find my tutorial showing how to paint underneath glass at Paint+Pattern. If I paint a glass coffee table, I can get a few things that I really like in the moodboards above. Using metallic paints, I can create a rich, mottled, burnished bronzey surface. I can paint my own patina. Maybe I’ll try mixing metallic paints with the Krylon Looking Glass paint that makes a mercury glass look. Maybe I’ll add stenciled patterns. To be honest though, after looking at all the bold and unique coffee tables I shared first, these daintier gold ones make me feel … deflated? Disappointed? Not sure of the words, but not super excited about the possibilities. I think you just have to imagine the table with a dramatic painted top? 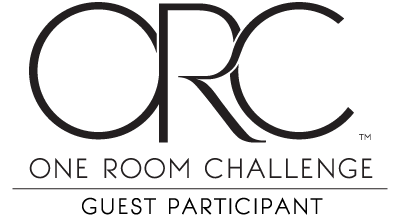 It’s getting late in the One Room Challenge game to play with more and more ideas. It’s time to get stuff done! There’s a few things here that threaten our ability to get this done within 4 weeks. We’ll see. The paint that I set my heart on for the walls has to come from Europe in a boat!! I didn’t know that. I’m not changing my paint plan — I really want to use this paint. And, we did procrastinate with contacting roofing contractors and making final decisions on flooring. * Our Siamese cat chewed strings on the window blinds 12 years ago when she was a baby. The blinds haven’t worked since then. For all those years they’ve been kept closed with a piece of jute string tied around them!! Some things in this room are long overdue! I find that all the coffee tables above are just so unique. Beautiful.